"There is no standard procedure for dismantling old systems. We individually analyse each old turbine and decide what the safest and most efficient dismantling concept is," said Lars Vogler, one of the responsible project managers at Deutsche Windtechnik Repowering. "Particularly in the case of old lattice masts, it is often not worth the effort to dismantle the tower step by step and reassemble it somewhere else. 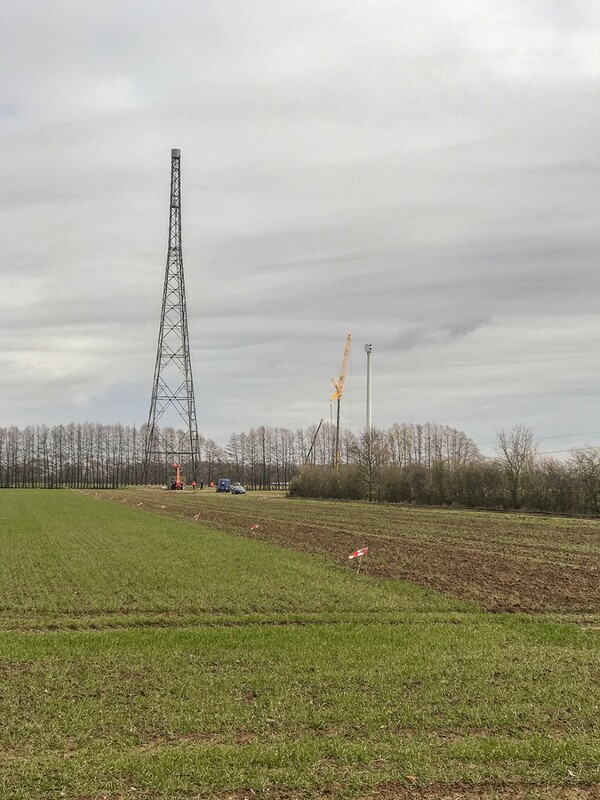 Here at the Blender wind farm, we also had the special situation that the height of the tower and the way it was built would have made it impossible to guarantee the safety of the service technicians during manual disassembly." A controlled blasting has the advantage that it can be planned and carried out at a precise point in time, so it provides a high level of safety. The blasting is prepared and timed so precisely with regard to tower statics that the tower only comes down in a controlled fashion when the blasting expert gives the appropriate signal. 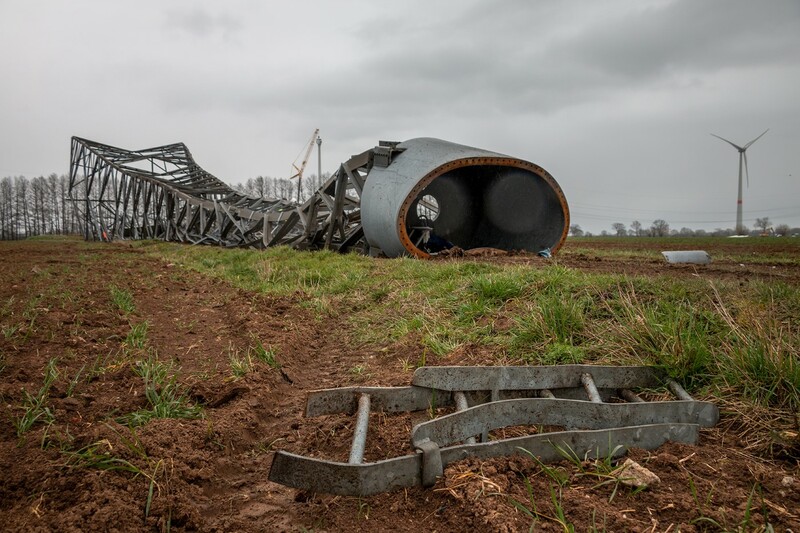 "For the lattice mast of the V47, the fall direction was designed in such a way that the tower fell directly onto the access road," said Lars Vogler. In addition, the lattice mast had the advantage that the energy generated by the fall was absorbed to a large extent by the steel framework. "As expected, the overall process was relatively quick, and ground damage was kept at a minimum, as planned. This has a positive effect on the cost balance, which depends significantly on the preparation as well as the amount of work necessary for renaturation." The blasting of complete wind turbines or their towers as part of repowering projects are still the exception. "The towers are usually dismantled the conventional way, i.e. disassembled step by step, so that they can be reassembled elsewhere when the old system is sold," Lars Vogler explained. In his view, blasting is always more cost-effective than dismantling in the case of old turbines that cannot be sold, provided the system has a hub height of at least 70 meters. The crane costs, which rise exponentially with the hub height, make up the main savings. The turbine of the V47 had been operated and maintained by Deutsche Windtechnik during recent years, and due to its good technical condition, the nacelle could be dismantled and resold by the repowering experts at Deutsche Windtechnik before the blasting was carried out. The turbine is expected to feed green energy into the grid for a few more years at its new installation site. Bremen-based Deutsche Windtechnik AG offers a single-source full technical maintenance package for wind turbines in Europe, the USA and Taiwan. The company operates both onshore and offshore. More than 3,600 wind turbines are serviced by over 1,150 employees worldwide as part of permanent maintenance contracts (basic and full maintenance). Its system engineering focuses on Vestas/NEG Micon, Siemens/AN Bonus, Nordex, Senvion, Fuhrländer, Gamesa and Enercon turbines. Further information about the company's focus on repowering is available at deutsche-windtechnik.com/onshore-repowering . The lattice mast of Vestas V47 before blasting at windfarm Blender. The lattice mast of Vestas V47 after blasting at windfarm Blender.